SUM is the most widely used Excel Function – Nothing complicated, it just adds things up. This Function can be used to add specific values or the contents of cells. Excel will calculate that the answer is 10 and display that. 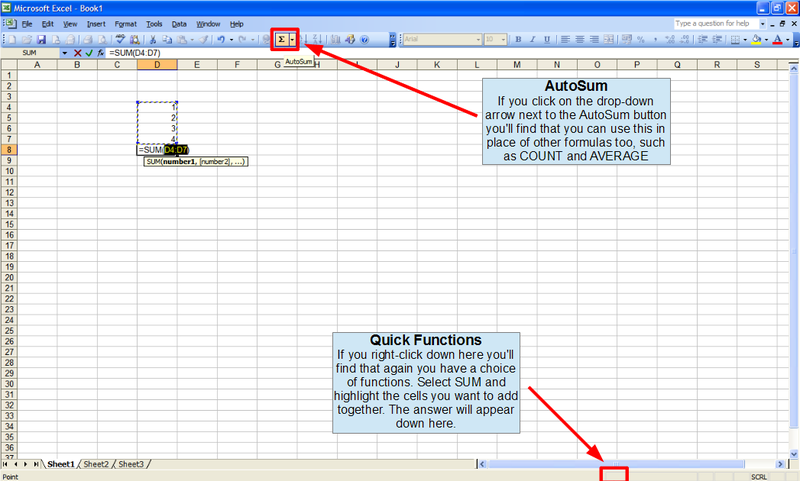 If you click on the cell again and look in the Excel formula bar you’ll see the formula you just entered. Of course it’s far more likely that you’ll want to use cell references rather than specific values. 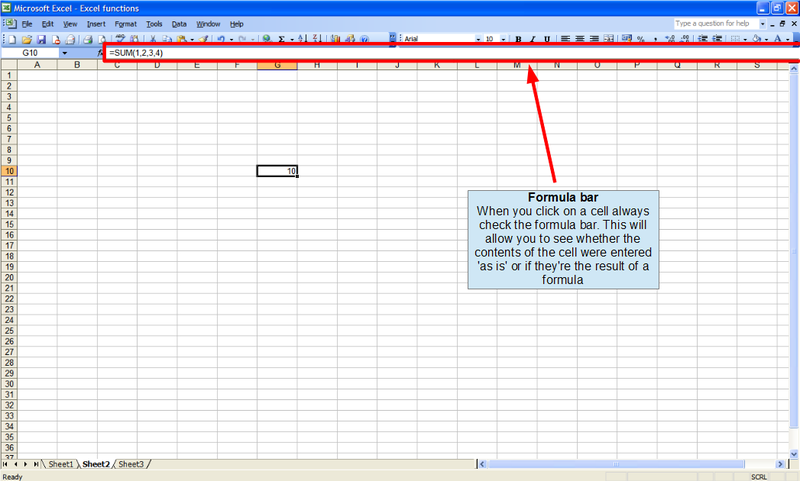 To do this just enter the formula as normal, but select the cells you want to include instead of typing in values. For information on how to do this, see the Getting started with Excel formulas page. If you’re feeling lazy there are a couple of quick ways to use this function without typing anything: AutoSum and Quick Functions. To use AutoSum simply select a cell and click on the button with the Greek Sigma character on it - I've highlighted it on the above screenshot. Excel will try to work out which cells you want to include in the formula – In the example above I selected a cell immediately below a column of numbers and Excel worked out that I wanted to add them up. If the wrong cells are automatically included you can manually select cells instead. Quick Functions are a great time saver – To use them just right click in the grey bar at the bottom of the window and select the Function you want to use. Now highlight the cells you want to include, and the answer will appear in the grey bar. If you’re still struggling with the SUM Function you might find it helpful to have another look at the Getting started with Excel formulas page.